We all do messaging, which is quick and easy way to stay in touch with your friends. What about special friends who cannot listen?, people who are deaf. ‘Five’ App seems to fill this gap now. Five is a messaging app created especially for deaf people and it’s created by a boy name Mateusz Mach. Mateusz Mach is an 18 year old big hip-hop fan, CEO of Five, in Poland. He is one of the youngest entrepreneur and co-founder, currently studying at an International Baccalaureate (IB) school. Deafness or hearing loss is a big problem for deaf people, sign language helps to bridge the gap between those who can hear and those who cannot. Sign language is easy and very effective method to communicate, using a hand gesture and symbols for those, who are hard of hearing, it is a way to interact with the world around them. Sign language is interesting and easy to being able to communicate with the hearing impaired or deaf people, it is growing in business around the world. Many colleges and universities have developed degree programs in sign language to fill this need. Five started as a silly app, designed by Mach and developed by a bunch of freelance coders, that lets you and your friends send one another custom hand signs, like the kind rappers throw. Over the weekend, 18-year-old Polish entrepreneur Mateusz Mach went to his high school’s senior prom. 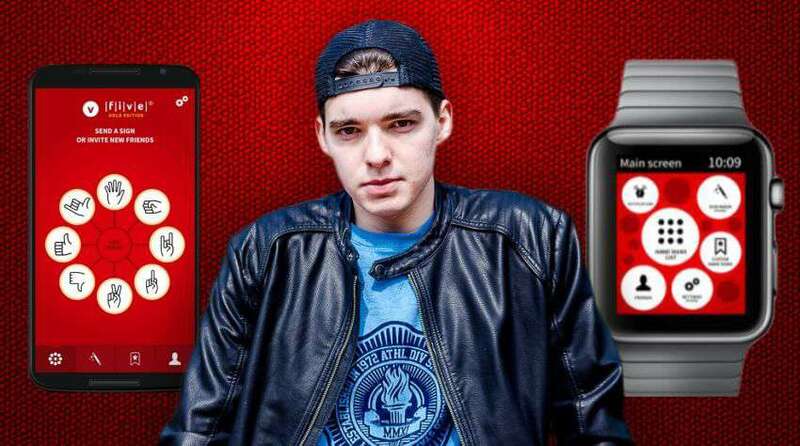 Mach announced about his app and raised the equivalent of about $150,000 in funding – no easy feat in Poland, where venture capital cash can be hard to find even for seasoned entrepreneurs. This app allows users to either choose an existing sign or create their own using the app’s sign maker, which allows user to have ‘thousands of different options and combinations.’ user can even sign your name if you’d like too. The user can then select a friend to send the sign too. The app is integrated with Facebook Messenger to allow user to send signs to friends, that aren’t yet using the Five apps. The current version is available for download on the Apple App Store and Google Play Store. Mach plans to relaunch Five, in this summer, in the USA (winter in South Africa). Five apps initially was not intended for deaf people. When Five were first released to the world in 2015, Mach was expecting people to use it on their Apple Watches and phones as an easy, funny way of communicating simple concepts. For instance, Mach and his friends used it to communicate how far away they were, using a commonly-accepted translation for each hand sign. But soon, deaf users started coming to Mach, thanking him for making an app that actually lets them communicate in International Sign Language (ISL). And so, seeing opportunity, Mach hit the road, winning local startup competitions and attracting some media interest as a promising young entrepreneur. Once he had a little bit of buzz, he started hustling for investment cash, which isn’t easy for a CEO when he is still in high school and don’t have a network of contacts. Through all of this, Mach plans to continue his studies even while serving as CEO of Five. He’ll graduate from his International Baccalaureate high school program this spring, and he plans on enrolling as an economics major at the Abu Dhabi campus of New York University later this year. Juggling the demands of entrepreneurship with a college education may be difficult, but Mach says that he fully intends to finish out his degree, no matter what precedents were set by the likes of Mark Zuckerberg and Bill Gates, who never graduated college.